Black Ice Software - Tiff Viewer version 11.34 is released! Automatic Annotation loading from file when opening a document and new feature to hide annotations! 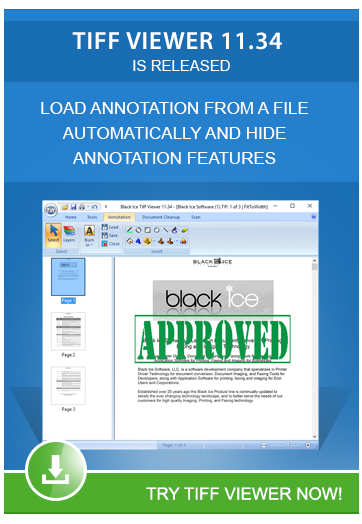 Black Ice Software has released version 11.34 of the Tiff Viewer including new capabilities to automatically open the annotation file when opening a document in Tiff Viewer. If the annotation file has the same name with .ann extension. With the new annotation opening feature, users can use and manage annotations from external files more easily. The Tiff Viewer version 11.34 comes with new features to hide the annotations on the opened document. This allows users to print the documents without showing the annotations. This feature could be very useful. When the document annotations contain confidential information, and you would like to print a copy of the document to third party, without the confidential information. Tiff Viewer version 11.34 also includes updated documentation to let users take advantage of the new features, and to improve the user's experience. Do not forget to subscribe to future releases by purchasing maintenance. With an active maintenance subscription, you will receive all new releases for free with your subscription! Priority email technical support is also included in your subscription. For more information, call us at +1 (561) 757- 4107 Extension 2, or impactsales@blackice.com.